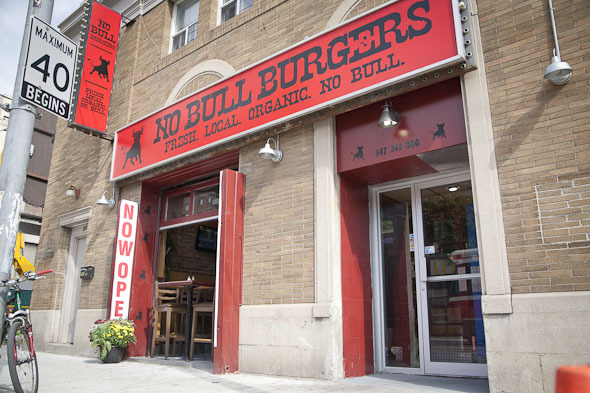 No Bull Burgers at Queen and Parliament is the latest restaurant to join the Toronto gourmet burger frenzy. And good news! When it comes to satisfying that insatiable craving for that good ol' burger and fries combination, No Bull Burgers delivers the goods with everything built around their homemade patties, made fresh with local and organic beef minus any fillers or processed ingredients. 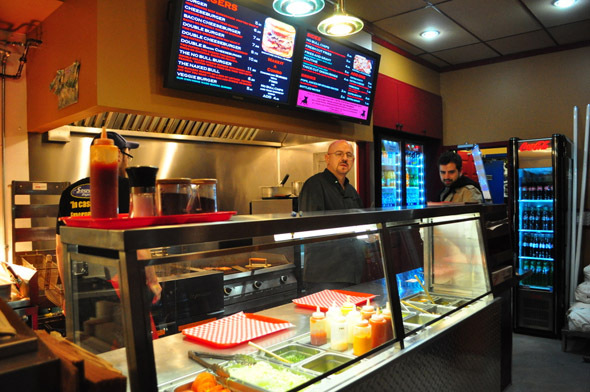 I ask father and son co-owners John and Tony Tsakanikas who also own and run Souvlaki Express next door) what made them decide to open this burger joint last month. They admit at first that they were considering a dessert or gelato place but then decided to go with what they knew best which is providing piping hot, fresh quality meals. The restaurant is tiny and minimalist with a very casual and comfortable vibe. 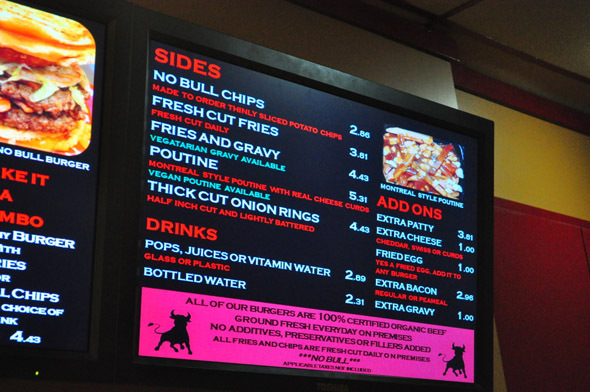 The menu is simple and the prices are very reasonable with burgers ranging from $5-9. For non carnivores, there's a veggie burger made from deep fried quinoa but, really, this is primarily a place for meat eaters. Another offering that catches my eye is the signature No Bull Burger which consists of the aforementioned homemade burger patty, two types of bacon, a fried egg and all the fixings you want piled between two grilled cheese sandwiches. Sounds like a rival to Holy Chuck . 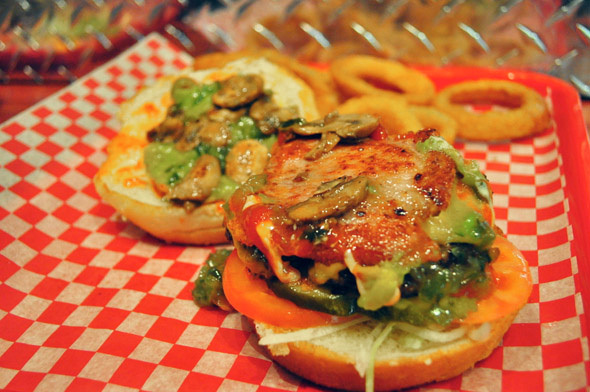 All burgers in the menu come with your choice of run of the mill toppings as well as the option for guacamole, salsa, caramelized onions, sauteed mushrooms, chipotle mayo and roasted red pepper sauce (all free of charge). My friend opts for the bacon cheeseburger ($7.08) and makes it a combo with onion rings and a pop for $13. His fresh patty comes sizzling off the grill with a generous portion of non processed cheddar cheese and peameal bacon and is placed between a soft warm sesame seed bun. He especially enjoys the generous amount of chipotle mayo on his burger as the tangy garlic kick from the chipotle compliments the in-house secret spices used to marinate the juicy and tender beef. His side of beer battered onion rings, also made in house, come crispy, thick and golden brown with just the right amount of grease to satisfy rather than feeling like you need to be hosed down. 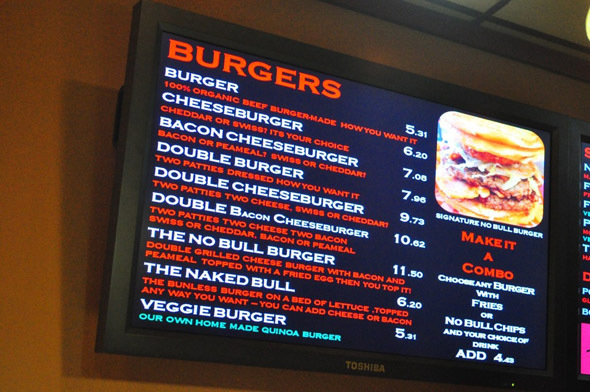 I go for a Naked Bull , otherwise known as their bun-less burger ($6.20) and make it a combo with a side of fries and a pop ($11). 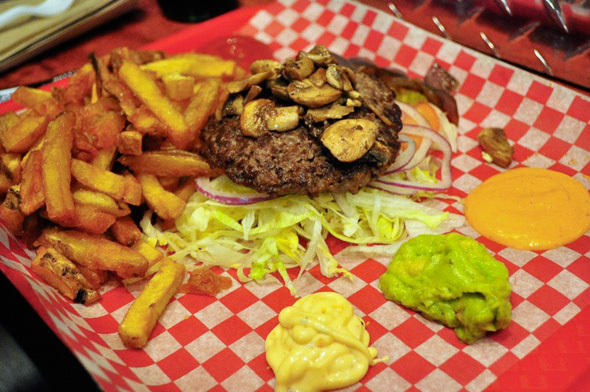 I get a mixture of almost all the burger toppings with the juicy grilled beef place on top and also get a side of fresh guacamole, chipotle mayo and a roasted red pepper sauce. My beef is firm and juicy with the beef marinated enough for me to enjoy without missing the bun despite the fact that I'm a carb-a-holic. It's a bonus to have the thick chipotle mayo and the sweet and creamy roasted red pepper dip do dunk my fries in and both sauces compliment the beef so well that this alone is enough for me to promise a return trip. My 100% fresh cut yukon gold fries are also made right to order and are golden and crisp on the outside while hot and fluffy on the inside. Just like the onion rings, the fries hit the spot without being overly greasy. 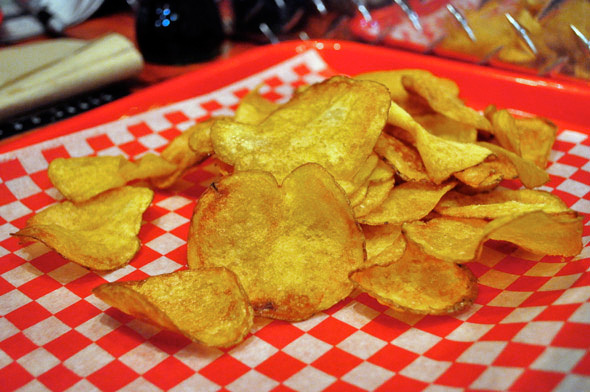 We're also served a complimentary side of fresh cut homemade chips sprinkled with sea salt ($2.86) to share which are fresh, crunchy and hot making them incomparable to any store bought bagged chips.